From April 1 to June 7, 2016, the Caltex Fill Up on Xcitement promo gives motorists who fuel up at participating Caltex stations a chance to instantly win two (2) movie tickets in the form of coupon codes. For a single-receipt purchase worth Php500, a thermal receipt is generated which indicates whether the customer wins movie tickets via electronic raffle. 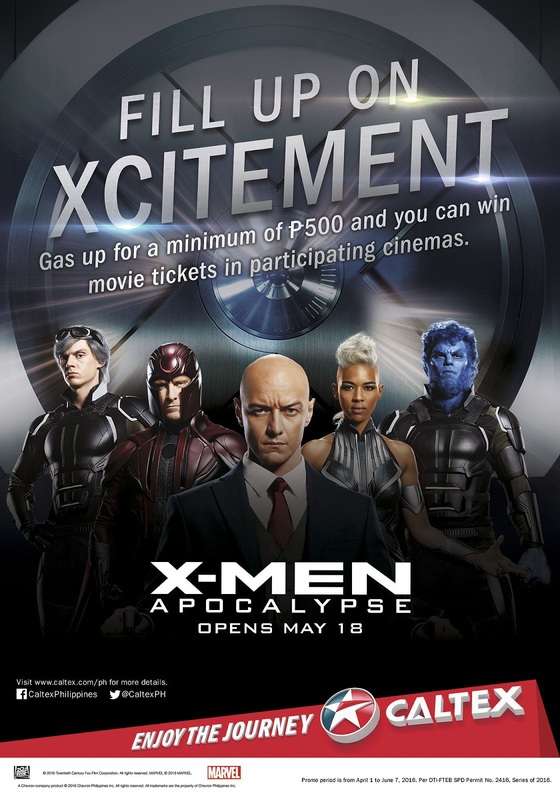 Winners may redeem their X-Men movie tickets from May 18, 2016 to June 7, 2016 at any of the participating cinemas or until such a time that the movie is still showing at these cinemas. Customers may win more than once. For a list of participating Caltex stations and participating cinemas, and complete mechanics of the promo, please visit www.caltex.com.ph.